A few hours ago, a photo Beyonce and Jay-Z’s twins randomly appeared on the internet. Neither the two posted the photo and Yoncé’s mother Tina was also not the source the leak. It remains unknown exactly how this image found its way online, especially taking into account how secretive the couple has been with the twins, but an adorable new picture Blue Ivy Carter and her younger siblings Rumi and Sir is circulating the web right now. The black and white photo has been posted by several outlets so far and it appears to have been taken from inside the Carters’ home. The edge a picture frame is seen on the side so there is a possibility that somebody quickly snapped a photo it while walking through the Carter residence. Blue Ivy is seen sitting in the grass with her baby sister and brother in her arms. We rarely see images Rumi and Sir so for this to find its way online is a pretty big deal. Members the Beyhive are freaking out, gushing over how cute the kids have gotten since the last time we saw them. It’s also worth noting that despite his extremely young age, Sir has already perfected his Jay-Z scowl. Take a look at the photo below to see a recent snap all the Carter kids. Whoever leaked this is probably getting an ear-full on the phone with Beyonce’s assistant right now. Drake‘s in Europe right now on the “Assassination Vacation” tour with Tory Lanez which is expected to conclude later this month. The rapper is currently in London right now where he’s in the middle a seven-night residency at The O2 which actually changed their sign to the O3 in honor Drizzy’s Grammy-award winning single, “God’s Plan.” Unknown Vlogs’ recently nabbed Drake and the rest the OVO team backstage for the latest episode “How Much Is Your Outfit? and needless to say, there’s a lot OVO gear involved. The OVO team showed f their outfits backstage at the “Assassination Vacation” stop in London. Drake stood on the sidelines and allowed the rest his team to show f what they’re rocking. Many them were donning OVO gear but Drizzy himself showed f his outfit which was worth nearly $1M. Drake’s jacket and shoes together were $26K and his Tom Ford turtleneck and trousers put him up to $29K. The rapper’s accessories are really what brought him to nearly a mill. His diamond chain is worth $200K and his Richard Mille rm69 is $750K. Altogether his outfit cost $979K. After years at the helm the Green Bay Packers, head coach Mike McCarthy was fired by the team back in December after a rough loss to the Arizona Cardinals. McCarthy recounted the experience being fired to ESPN, where he explained that he was actually quite shocked by it all and wasn’t exactly the biggest fan how it was all handled. McCarthy led the team to a Super Bowl at the beginning the decade and was a beacon consistency alongside Aaron Rodgers. Considering his standing with the team, he felt as though the way he was let go was cold and unnecessary. “It couldn’t have been handled any worse. 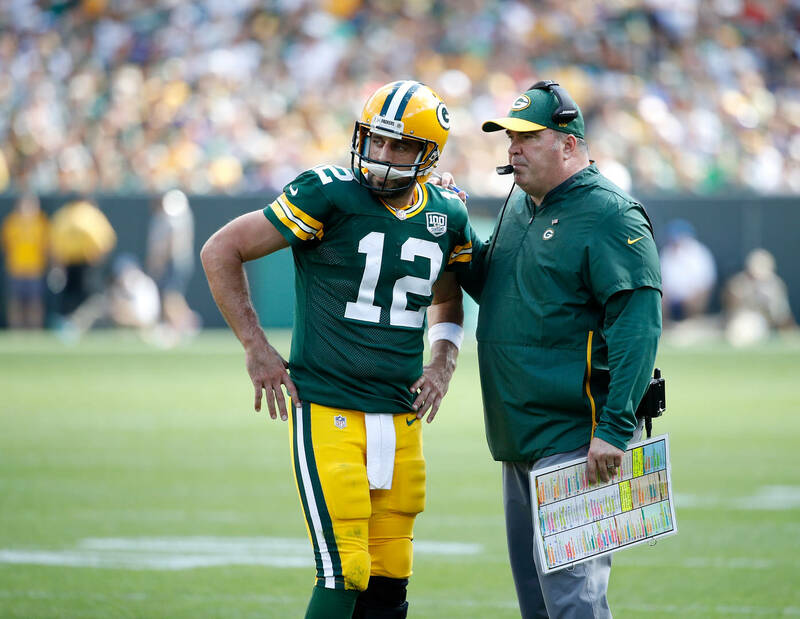 Anytime you lose a close game, it’s a difficult time emotionally afterward, but when you lose a home game at Lambeau Field in December, it’s really hard,” McCarthy explained. The Packers ultimately ended up missing the playfs with a record 6-9-1. Lil Uzi Vert has drawn the short end the straw, where career drama is concerned. Despite having one 2017’s most successful singles, Lil Uzi has been on somewhat a forcefully-imposed hiatus. 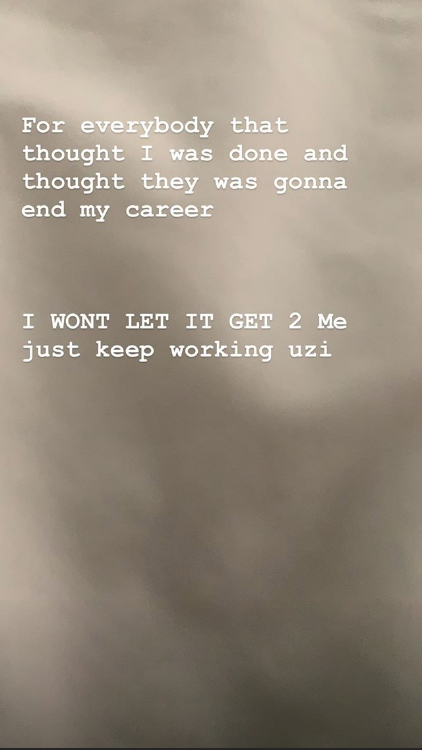 Though responsibility is difficult to dole out, Uzi has pointed the finger at both DJ Drama and Don Cannon, who have since claimed they’re doing little in the way meddling. Despite the muddy circumstances, which recently found Roc Nation sliding through to stage an intervention, Uzi’s Eternal Atake remains in a purgatorial state. And yet, Lil Uzi has chosen to look at the glass half-full. At this moment, it’s unclear what Uzi’s ultimate fate will be. At this point, the delays are verging on farcical, and while “Free Uzi” briefly acted as a lightning rod sorts, the single was summarily pulled from all ficial streaming services. At this point, whether it be contract renegotiations or heated exchanges hearsay, Lil Uzi Vert‘s place in the game will remain a question mark. We can only hope his newfound positivity remains, as there’s no telling what lies ahead for the young talent. “I danced all night. I drank more than I’ve ever drank in my entire life,” she explained. “I woke up. I thought I was dead. I definitely woke up dead.” She explained how the hungover tied into her overworking herself from the whole year 2018. Penny Hardaway’s signature shoe, the Nike Foamposite Pro has been one those sneakers that you either love or hate. It’s a pretty hard sneaker to pull f and over the years, the shoe has lost a bit its luster. Despite that, sneakerheads can always appreciate a nice Foamposite and Nike hasn’t stopped supporting the silhouette. The latest entry into the Foamposite Pro library comes in a “Hyper Crimson” colorway that is actually being released this weekend. Nike just recently unveiled the ficial images the shoe. The upper looks like it is completely made bronze material, although there is some faint tint pink in there. Meanwhile, the upper half the shoe where the laces and tongue are is black; a feature that is fairly typical most Foamposite colorways. Orange highlight can be found throughout the shoe on places such as the tongue, insole, back heel, and even the outsole. The tributes for Nipsey Hussle continue to roll in for those who were deeply affected by his death, but none can compare to the loss felt by those who were closet to the rapper. His family has stayed silent these last few days as they’ve processed the incredible devastation that Nipsey’s murder has left them feeling. Just an hour ago, the rapper’s sister Samantha Smith shared a photo herself with Nipsey, an image that was full smiles and memories much happier times. You are my heart. You are my strength my wisdom my joy my balance. You are my Superhero. Invincible to me. I feel so safe with you. I feel so covered and protected. Imperfections do not exist with you because you are flawless. I need you I need you please let me hold you again. You are my baby. To the world you are the strongest man and to me you are the most vulnerable innocent child. Your heart is pure they don’t know you like we know you. Your love is expansive. Talk to me again. You’ve taught me so much. You hold me down through everything. I got Lauren. I got Emani. I got Kross. I got Sam, he is my responsibility now. He is my big little brother. I got mommy and Granny and Pop. You gave me so many tools. You gave me so much insight. We will talk every second everyday and I am here to carry out your vision. Ermias God Will Rise. I love you forever and I will cry forever. You are my lifeline as long as I am here you are too. Earlier today, Nipsey’s love, longtime girlfriend, and mother his child Lauren London broke her silence by sharing a photo the rapper with a short, but sweet, message. She called him her best friend, her sanctuary, and her soul, while stating that she is “lost” without him. Although the Interscope Records artist didn’t share any additional details about the LP, he did announce dates for a tour in support of the project. Tickets for the tour go on sale this Friday (April 5). SoundCloud has released an all-new profile experience for iOS users today. SoundCloud bills itself as the world’s most social streaming platform, and says its new user experience aims to reflect that. The entire profile has been reconfigured to place creator and listener profile photos, header images, biographies, and spotlights at the top. A recent cash injection from investors helped to . SoundCloud also underwent some to help re-align the company towards profitability, but the recovery is now well underway. Now, SoundCloud is working hard to redefine itself as a leading trendsetter — where stuff gets hot before it goes mainstream. Just recently, the company hired former Apple exec as senior VP and head of Subscriptions & Marketing. Check out Conor and Khabib’s latest back-and-forth in the posts embedded below, and click here to relive some McGregor’s best UFC fights all-time. The death Nipsey Hussle is still a hard pill to swallow. A lot people, whether it’s fans or people in his own community, are still in disbelief over the news. The rapper was shot and killed outside his Marathon store on Crenshaw in Los Angeles in broad daylight, suffering multiple gunshot wounds. According to The Blast, the Los Angeles Medical Examiner has determined that the rapper’s cause death was from “gunshot wounds the head and torso” after Nipsey underwent an autopsy earlier today. Officials also determined that Hussle’s recorded time death was at 3:55 p.m. Following the rapper’s death, the LAPD commissioner revealed on Twitter that Nipsey, along with Roc Nation representatives, was supposed to meet with police ficials to discuss the ways he could curb gang violence in his neighborhood. Nike and Jordan Brand have plenty highly anticipated sneakers set to release in April, including a couple kicks from Jordan’s recently revealed 2019 Summer collection. In addition to the plethora Js on tap for the coming weeks, Nike will also be releasing the winning sneakers from the annual “On Air” collection, as well as a new colorway Kevin Durant‘s latest signature sneaker, the Nike KD12. Scroll down for a preview what’s in store from Nike and Jordan Brand this month. While Justin Bieber is currently teasing fans with the idea that he’s expecting his first child with wife Hailey Bieber, he’s also dropping f throwback videos himself freestyling. While the video is new to his many fans, it’s not new to him since it’s from 2015 when he was on a yacht with his friend, Johnny Shahidi. The video, as seen in the tweet below, isn’t anything too crazy and just hears Biebs rhyming Minute Maid with getting laid and talking about flying girls out – classic pre-married Justin shenanigans we assume. As for new music coming from Justin, we may be waiting a while longer since the “What Do You Mean” singer previously announced a break to mend some “deep-rooted” issues. WWE’s “Road To Wrestlemania” is coming to an end, as Wrestlemania 35 is set to take place this upcoming Sunday, April 7, at MetLife Stadium. In celebration their biggest PPV the year, the WWE has an exhausting list events planned in and around the New York City area this week, including a special sneaker collaboration with FILA and Foot Locker. Among the sneakers set to release are two FILA O-Fit “Wrestlemania” colorways that reflect on some the biggest moment’s in the PPV’s history. The New Day’s Ki Kingston, who will challenge Daniel Bryan for the WWE Championship on Sunday, and Sasha Banks, one half the women’s Tag Team champions, have also taken to social media to share images their exclusive collabs. The New Day x FILA O-Fit is limited to just 483 pairs, as a nod to The New Day’s record tag title run, while Banks’ FILA Disruptor is limited to 713 pairs, signifying the day she made her RAW debut (7/13). The New Day themed sneakers will release on April 5, while the other three colorways will be available on April 4. All the sneakers will be releasing exclusively through FootLocker.com and the Foot Locker location in Times Square. Los Angeles, CA – Prayers are rolling in after Nipsey Hussle was reportedly shot outside of his Los Angeles store on Sunday afternoon (March 31). Although his condition is currently unknown, CBS reports he was shot as many as six times. Footage captured at the scene shows emergency responders delivering CPR. Of course, there’s been an outpouring of support on Twitter as people await news of his condition. He was presumably rushed to a local hospital where he’s receiving treatment. Although some people are already circulating an #RIP hashtag, Nipsey’s death hasn’t been confirmed. Respect Nipsey’s children and family and stop posting and sharing videos. Praying for @NipseyHussle so crazy right now.